Muncie. NS siding at River Drive by Nichols Ave. 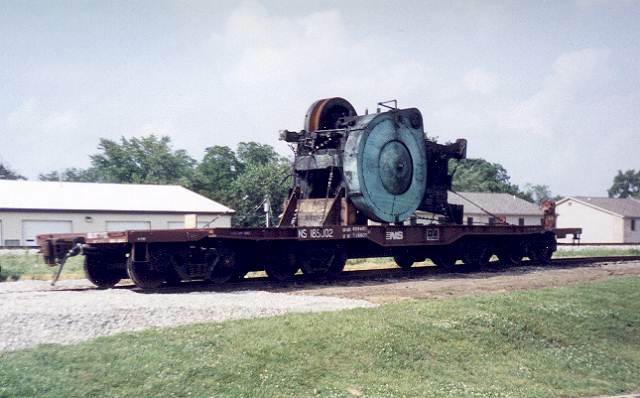 Ever wonder how heavy machinery was loaded onto flatcars without a crane? Well, on the odd chance that these loads would come through Alexandria, I pulled out my throw-a-way camera and took these shots. They would make an excellent modeling project and quite an attractive scene on a model railroad. 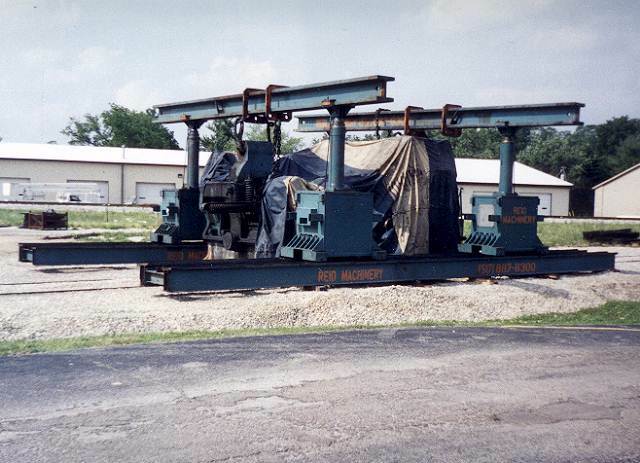 Photo 1 - The side view of the covered machine surrounded by the lift frame. 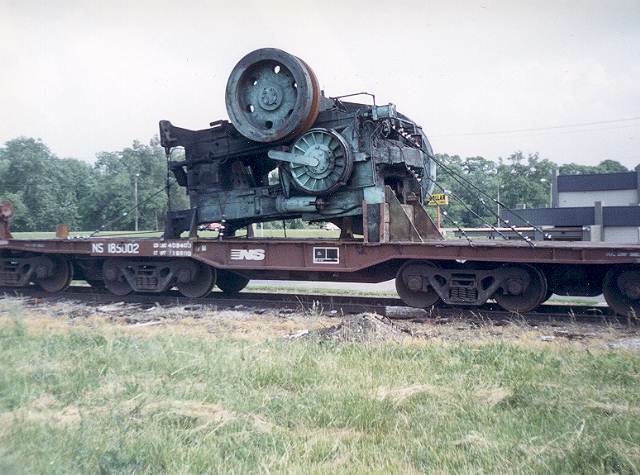 Notice the tracks coming out from the left side. Photo 2 - Notice the hydraulic lifting mechanisms on each corner. 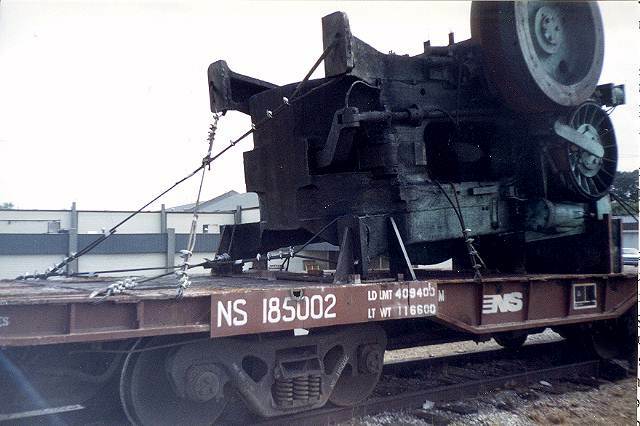 There are designed to ride on tracks for positioning and the cylinders will hoist the load while a flatcar is positioned underneath. You can see an already loaded flat behind and to the left. 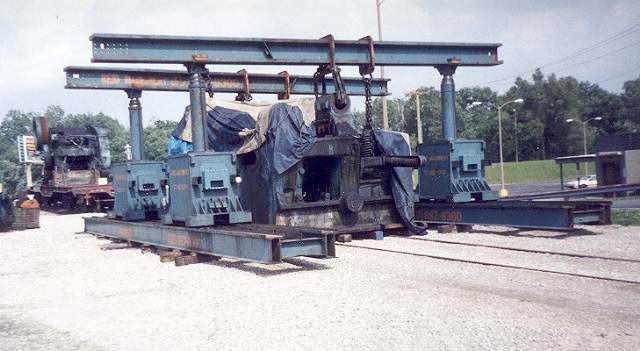 Photo 3 - A good end view showing the chains in place ready to lift and the blocking that the machine is sitting on. Photo 4 - A good shot of the flat that was already loaded. 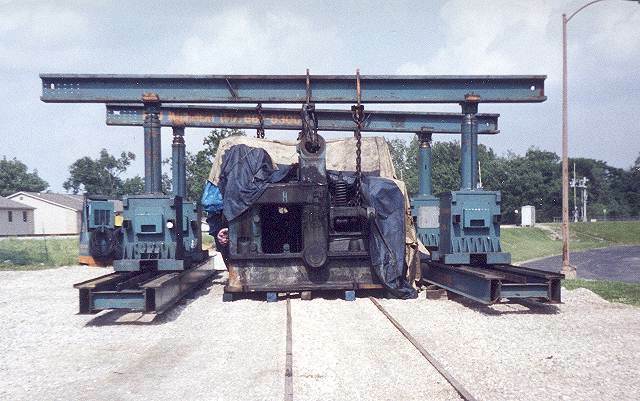 Notice that this is a four trucked flat designed for heavy loads. Photo 5 - The other side with a good view of the bracing under the load and the crisscrossed tie downs. Photo 6 - A close up of the tie downs clearly showing crisscrossing on both the upper and lower tie downs as well as the anchoring to the side frames. Note the small burned hole just above the 5 and 0 where another tie down had been. Photo 7 - As I was finishing up, the sound of a horn in the distance drew my attention to movement on the nearby Frankfort Main. 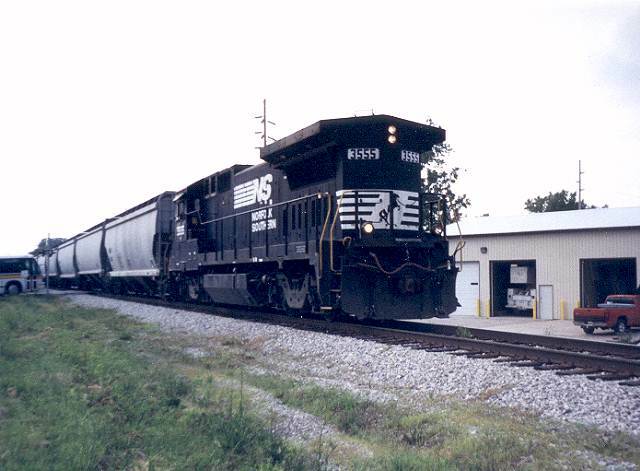 Within a couple of minutes, the NS 3555, a GE Dash8 32B came by Eastbound with a consist of grain cars from Madison County (see, there is a tie in). This scene stayed as it was for a couple of weeks and although I drove by as often as possible, I was never fortunate enough to catch the load being set on a flat.